The headquarters of The American Institute of Architects defines a truly unique venue, located in the heart of Washington, DC! Floor to ceiling windows provide endless amounts of natural lighting, along with open floor plans that set the stage for a productive business meeting or extraordinary special event! 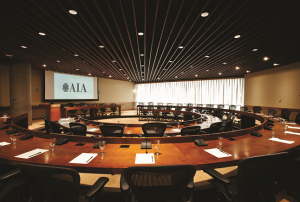 The AIA Boardroom, along with the Outdoor Courtyard are only a part of over 10,000 square feet of flexible meeting & event spaces that include state-of-the-art-technology and on-site food & beverage options. 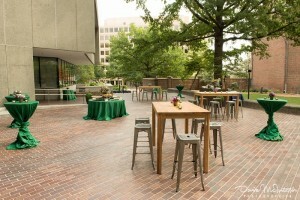 The American Institute of Architects will provide your guests with the quintessential Washington, DC experience! Rental rates vary from $400 for a weekday business meeting to $6,000 for weekend social events. Please call for more details. Event end time is 12midnight. On-site catering provided or choose from a list of recommended caterers; outside caterers are allowed, with prior approval in advance. Meeting rooms are equipped with state-of-the-art technology, including a wireless broadband network and video conferencing capabilities. No on-site parking is available; valet parking is recommended. Street Parking and local parking garages based on availability.